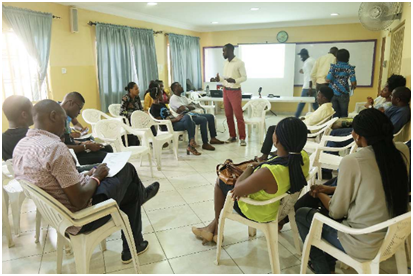 The Abuja Global Shapers Community, on Saturday, 22 October 2016 held the fifth and last session of its Employability and Entrepreneurship Programme (EEP) for 2016. The Employability and Entrepreneurship Programme (EEP) is the flagship project of the Abuja Global Shapers. Launched in September 2013, it is designed to help bridge the skills and knowledge gap among young job seekers and entrepreneurs in Nigeria. The EEP team is led by Jumoke Adekeye and Nnamdi Ogbuagu, and as of October 2016, the programme has trained more than 500 participants in CV writing, interview preparation, effective communication, and computer skills. The EEP’s vision is to scale-up the programme to equip 7,000 youth with employability skills to help them get viable jobs, and also provide business mentoring and coaching to 3,000 emerging entrepreneurs to expand their workforce and their businesses. Participants at the session were engaged in group discussions on personal branding and effective presentation skills. The modules were delivered in an interactive manner, with opportunities for those in attendance to demonstrate and receive feedback on what they had learned. Highlights from the programme included the award of certificates to participants, and recorded interviews of the attendees with the special video equipment from the World Economic Forum. The participants who were more regular in attendance will be given preferred access to employers at the Career Fair in November 2016.